Please check the page held by Mr. J. Takamura for more information about this model, Click here ( Japanese page ). 5538s are VERY different from another PS/55's. They are not MCA. 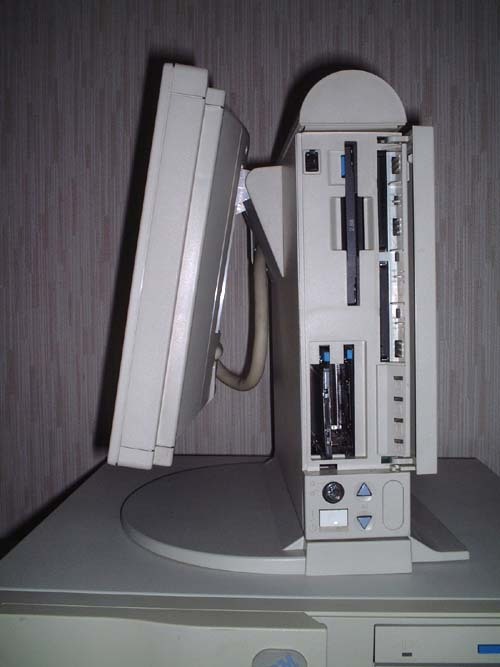 These models were called as "Green PC" when they came first ( IBM named it "PC STREAM" latter ). 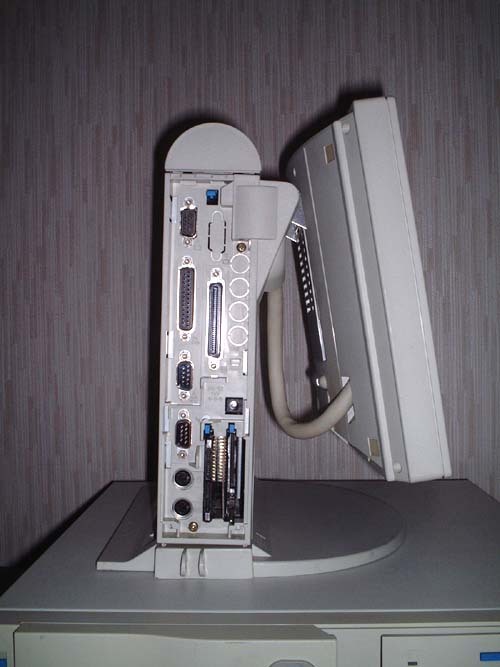 Unlike PS/2e, these models have integrated LCD panel. Imagine.. a ThinkPad planar in a thick vertical case with a pedestal and a integrated LCD panel which is adjustable in vertical direction, that's the 5538. For photo image for 5538-Z and 5538-V are available at IBM's web site. Early Models, " GREEN PC"
To get into setup menu, press F1 function key upon powering the system. Every sections in Easy Setup menu are written in English. SL ENhanced 3.3v parts are used for all models. CPU is loaded on a sub-board and any model can probably take other model's CPU sub-board. You probably *can* swap the CPU to AMD 5x86 if you are a good soldering iron man. recommended. at least genuine options for Z model are parity modules. ). According to IBM's guide book, 36MB is the max amount of RAM consisting with onboard 4MB RAM and two 16MB IC DRAM CARDs. But actually 5538 recognizes 52MB in combination of 4MB of base memory +16MB +32MB. According to Mr. Takamura's web page, IC DRAM memories are described as follows. Y/V/W models Can accept both Parity and Non-parity cards disabling Parity check in Easy Setup menu. U model Memory check selection is not provided in Easy Setup but both types are supposed to be usable. Upper DRAM slot should be exclusively used for 16MB and /or 4MB card. If 8MB or 32MB DRAM card are populated in the upper memory slot, the system will recognize only half of actual RAM installed. The Big Blue offers following genuine option cards. Third Party's products which I tested on 5538-YVB and 5537-ZAC. Click here for IC DRAM card. U/V Models supports E-IDE while W/Z/Y models supports legacy IDE with limited capacity of 524MB. I have a 820MB drive in my 5537-ZAC using EZDRIVE and it sees all 820MB happily. 1st drive is screwed to the inner structure and you need to disassemble the machine to exchange the drive. 2nd Hard drive slot is prepared for all models. You can use same drive cage which is used in ThinkPad models such as M23V, C23V and TP550/555BJ ). The cage is almost same with the one used for TP720/TP720C but the location of key holes beside the connector are little bit different. 1 FDD. 3-mode drive for -U/V/W model and 4-mode drive for -Y/Z models. Type 3 x 2 for -U/V/W. Type 3 x 4 for -Z/Y. NT4, Win95B and OS/2 J2.11 can see and use all of these PCMCIA slots with built in drivers. RS232C 9 pin x2, 1 parallel, VGA port for external display, mouse and keyboard. Mini Centronics 60 pin SCSI connector ( Z/Y models only ). -Y/Z models have a onboard FutureDomain SCSI controller and RS6000 style external connector. 538 is not a MCA designed PC neither have IBM MCA SCSI but it does have RS6K style 60 pin connector. Anyway Y/Z models have 4 PCMCIA slots, your second choice is to use PCMCIA SCSI card. If you are a real MAD then you may have one or two ( or more ) of external cables for the connector. 1) You have to activate SCSI section in Easy Setup Menu before you use SCSI devices. To get into the Setup Menu, press F1 key upon powering the PC. you don't have any SCSI devices attached to SCSI port. Win95 has a built in driver for the chip. Use FD 850/M/MER/MEX SCSI HOST ADAPTER. I used FDCD.SYS from Correl POWERSCSI for CD-ROM under DOS. WD90C24 is standard on the planers for models other than -Zxx. S3 86C928 is prepared for Z models ( provided as a sub-board ). In order to get 256C on Win95, you need to load VESA.EXE on your config.sys. VESA.exe is contained in a Video Driver Diskette for TP360/750. Or use 5538 Video Support Diskette ( Japanese ). Basically 5538 doesn't provide built-in audio function. I'm not sure about 5538-Zxx if it has built-in audio function or not. 5576-C01, mechanical clicking keyboard with a track point-II, is equipped with earlier models. There are two variations of this keyboard. One is with single cable and single connector to be connected to a Keyboard connector of 5538/5537. The other is with single cable from keyboard which is separated into two connectors ( thus it's called as " Y cable " ); one for K/B port and the other for Mouse port. It's advised that you need to use an " intermediate cable" together with C-01 K/B or other PS/2 K/B. Please observe following copy of a sheet which was shipped with 5537-ZAC. I don't know how the "intermediate cable" works. I myself have not ever seen it. I think most of 5538 users do not have the cable and they use their B-01 K/B and PS/2 mouse in Fig.III below without the cable. Want to know the secret of this " intermediate cable"
Connector type : 2-pin cylindrical connector, center + . Physically they look very different each other but basic concepts of these systems are, I think , same. PS/2E and PS/55E came to the market too early and they were too much expensive. 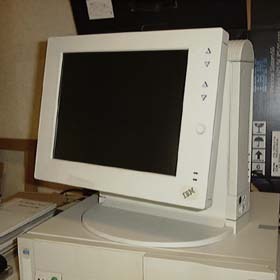 It may be said that PS/55E had been introduced to the PC market too early. Design and concept were great but the price was a killer for general consumers. PS55Es were mainly delivered to big companies as like as MCA PC/55s. Some of enthusiasts got one cheap NIB when IBM cleared out their surplus stock ( not so sure, but it was around 1996 to 1997. I happened to see a bargain sale when I was in Osaka ). I really wanted to buy one but it was still expensive to me though the price was discounted a lot. History repeating. 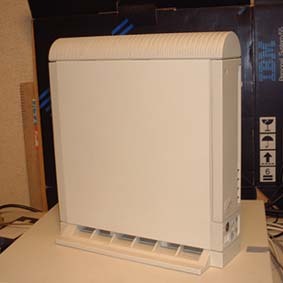 The same thing happened over here with the PS/2e 9533 "Pizzabox": it was a cash-killer when it was new and regularly sold by IBM. When the stocks were cleared in about '97 the system showed up (along with a cheesy 12" SVGA tube display) in supermarkets and computer stores - but was still too expensive for its performance and for "regular" users. I saw some back then, planned to buy one but stepped back when I saw the price tag. It still cost 950 DM at a time when a Pentium-90 system with monitor was down to 750. The Antique Computer Virtual Museum Maintained by D.B.Young.
" 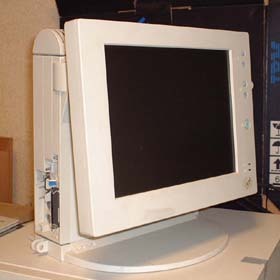 5538-Z without integrated LCD panel". That's 5537-Z. I''d like to call it " Monolith". ( but you have to load the driver *twice*). PS/55E line was followed by model 6870 PC710 with P-90, and now P-II or P-III something. ...far apart from PS/55 and MCA.